Do you know what makes a Monday more bearable? Well, other than coffee? Knowing that there is a three-day weekend coming up. Sadly, I have an event to work on Sunday so the full weekend is not mine to conquer but knowing that I don’t have another Monday for two weeks is pretty spectacular. You know what else makes Mondays more bearable? Recipes that don’t take hours to make...kind of like this salad! Full disclosure, this isn’t a main course so you want to whip up a protein to go alongside. I pan-seared thick cut pork chops simply seasoned with salt and pepper. They cooked up while the beets were in the oven and voila! Dinner in 30 minutes. Spinach is underrated. It’s nutritious, maybe not on the same level as kale, but it’s more tolerable. It’s also affordable making it easy on a budget and available year-round. The “salad" part of this recipe is super simple. 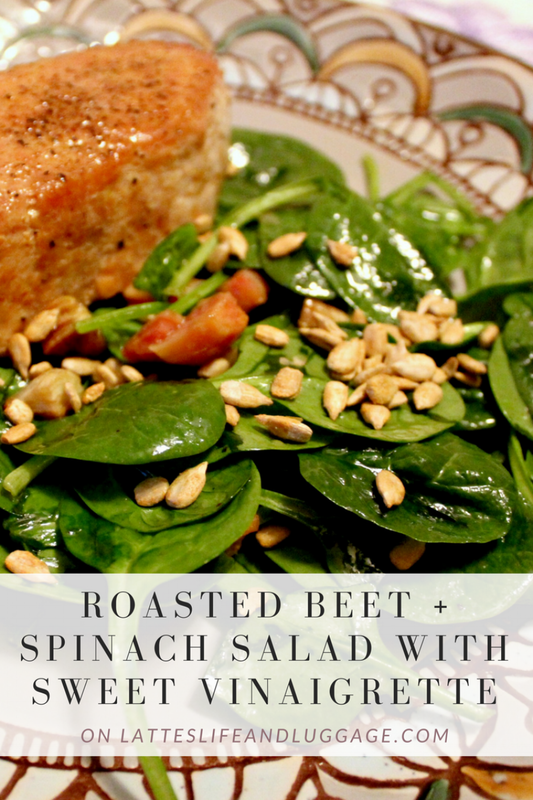 A bed of spinach is mixed with the cooked beets , topped with Parmesan and Pumpkin Seeds and that’s all she wrote! The warmth of the beets will slightly cook the spinach when mixed together. It won’t wilt the leaves but it will tenderize them and remove some of the bitterness. As for the vinaigrette, it’s a basic recipe sweetened up with honey. Adding Parmesan shavings on top adds a bite of flavor to balance the dish out. If you’d like to pan-sear a pork chop, season it well on both sides with salt and pepper. Sear each side over medium-high heat to get a nice crust on it. This will also seal in juices to avoid the meat from drying out. Turn it back over to the first side, lower the heat to medium and cover. Cook until the meat is done all the way through. Very simple. Same directions go for chicken breasts unless they’re thin cut then you can call it quits after searing the second side as long as there is no pink left. Tell me in the comments below how you manage Mondays a little easier. 1 - Preheat the oven to 400 degrees. Line a baking sheet with tin foil. Mix together the beets, 2 tbsp. Olive Oil, salt and pepper (to taste). Bake 15-20 minutes until fork tender. 2 - Make the vinaigrette. Mix together onion, garlic and red wine vinegar. Add in the dijon until emulsified. Add in honey for sweetness and slowly whisk in with the olive oil until thoroughly combined. 3 - Prep your salad. Mix together the beets and spinach while the beets are still warm. Toast the seeds in a small pan for about a minute or so until toasted and fragrant. Drizzle salad with vinaigrette, top with cheese and toasted seeds.